As Justin Bieber loves to preach to his millions of Beliebers, never say never. 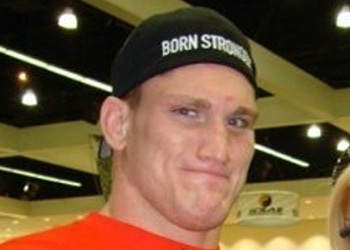 In a surprise move, Todd Duffee (Pictured) has been brought back to the planet’s premier mixed martial arts promotion. According to the Las Vegas Sun, the once-promising heavyweight will meet Phil De Fries at UFC 155 this New Year’s Eve weekend. The UFC confirmed the report by retweeting the Sun’s post. Duffee was unexpectedly released from the UFC after a shocking loss to Mike Russow in May of 2010. UFC president Dana White suggested the now-26-year-old had an attitude problem. He has only fought twice since his departure. Duffe was knocked out by Alistair Overeem in December 2010 in Japan and most recently notched a TKO victory over Neil Grove in April. DeFries, meanwhile, posted an impressive submission victory over Oli Thompson at “UFC on FOX 4.” The 26-year-old owns a 9-1 record. De Fries was originally slated to face Matt Mitrione in the December 29th event. However, “Meathead” was promoted to headline “The Ultimate Figter 16 Finale” against Roy Nelson. UFC 155 takes place inside MGM Grand Garden Arena in Las Vegas, Nevada.